Humanitarian supply logistics systems must be effectively coordinated to help people in disasters or emergency situations, a group of experts has concluded. Over 50 logistics experts from international organizations, which make up a roll call of those most frequently in the forefront in disaster response came together last week for the first time at the World Health Organization (WHO) in Geneva to discuss logistics management systems for humanitarian assistance in disaster situations. Chief among their conclusions are that logistics systems must be better coordinated and clearly transparent if humanitarian supplies are to bring the most effective help to people in crisis. There is an urgent need for better coordination of humanitarian supply logistics in disasters such as earthquakes and hurricanes. To do this, a common approach to exchange logistical information and an internationally standardized classification of supplies is vital, said the participants. 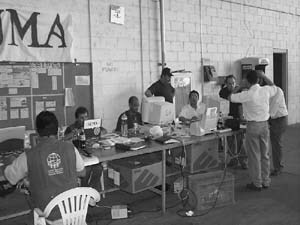 The workshop, a joint initiative of the World Health Organization, the Pan American Health Organization (PAHO), World Food Program (WFP) and the Office for the Coordination of Humanitarian Affairs (OCHA), was held to improve coordination between the agencies, governmental and non-governmental organizations (NGOs) and donors with respect to the logistics of international relief assistance in disaster situations. The participants agreed to use the experience and philosophy of SUMA, a system developed by PAHO and the Foundation for the Development of a Supply Management System (FUNDESUMA), as the base for development of this common platform. SUMA software has been used successfully in the last ten years mainly in the Americas, during and after large disasters such as Hurricane Mitch in 1998 and the El Salvador earthquakes in January 2001. Experts advise that a common system should be useful not only for the United Nations agencies and humanitarian assistance organizations, but also for national authorities in disaster-prone countries, who often lack logistics software to manage incoming supplies in an emergency situation, said Dr Claude de Ville de Goyet, chief of PAHOs Emergency Preparedness and Disaster Relief Program. From experience, we know that the availability of a logistics information system in a disaster situation helped countries like El Salvador and Honduras quite a lot in efficient management of international assistance. It also improved transparency and accountability for the management of donations, which is very important, Dr de Ville added. Frequently, countries that experience a disaster are flooded with tons of supplies, putting a great burden on already stretched relief staff who then must categorize and dispose of the material. 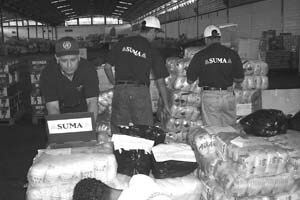 Systems like SUMA use simple software on laptop computers to track and sort incoming donations and their destinations, allowing disaster managers to see what they have and send it where it is needed. According to Dr Alessandro Loretti, of WHO Headquarters Emergency and Humanitarian Action department, a key objective of the meeting is to put crucial substance into coordination for emergencies. By providing people with a common logistic system, you decrease the difference between the beneficiaries - both national authorities and local communities and authorities - and the providers, and offer empowerment which is the only true form of capacity building Dr Loretti said. Other agencies have similar systems but they have not all been integrated into a common framework. Common categorization of items are necessary, as well as a central data warehouse to keep track of supplies and communicate among tracking systems. We are offering the countries and relief agencies, large and small, the use of SUMA as a basic tracking system, said Dr de Ville. In addition to representatives from United Nations agencies like UNICEF, UNHCR, WFP, WHO, PAHO, OCHA, also present at the Geneva workshop were representatives from International Committee of the Red Cross, International Federation of the Red Cross and Red Crescent, Médecins Sans Frontières, FUNDESUMA, OXFAM, NGO-coordinating agencies like VOICE and Interaction, users of existing logistics systems, and representatives of the private sector.